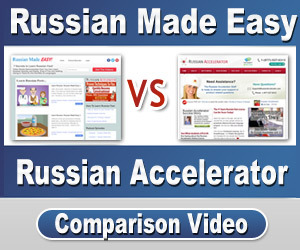 I get a lot of questions about the difference between Russian Accelerator and the Russian Made Easy podcast. I went ahead and made a video that should help clear up any questions you may have. Hey guys, I wanted to mention a new addition to Russian Accelerator. Due to the popularity of my Russian Made Easy series, I’ve created an all new podcast exclusively for Russian Accelerator members. Along with reviewing the course material, each episode contains a section I call ‘Russian Immersion.’ Entirely in Russian, it forces you to listen, think and respond all in Russian. And since the episodes are downloadable, you can learn without needing an internet connection. For the latest deal on the Russian Accelerator Online course, head over to Russian Accelerator Special Offer.